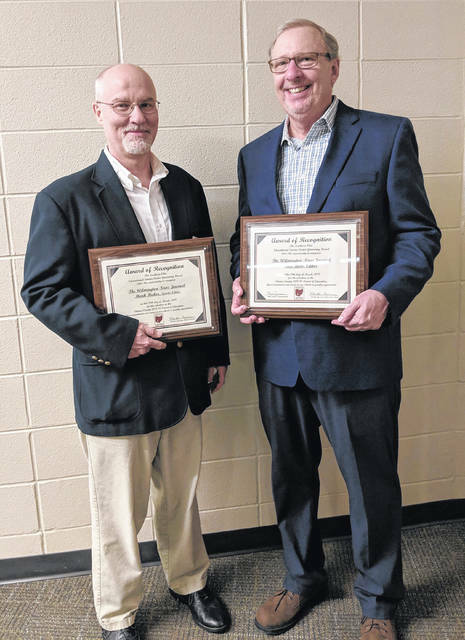 Two Clinton Countians were honored with Friends of Education awards — from left, News Journal Sports Editor Mark Huber and News Journal Editor Tom Barr. All of the night’s honorees, including superintendents, principals and Friends of Education recipients, gathered afterward for a group photo. WILMINGTON — Local educators were honored at the 22nd Annual Four County School Board Dinner and Meeting of the Southern Ohio Educational Service Center (SOESC). 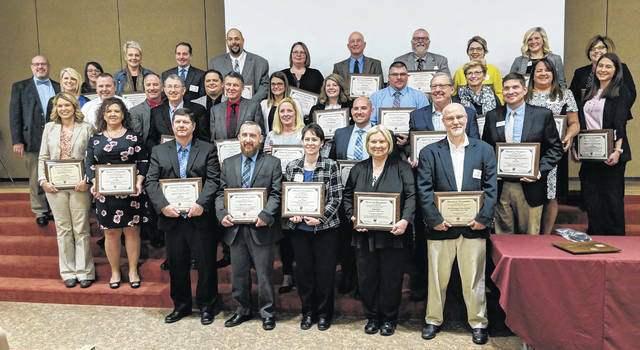 Superintendents, school board members and other honorees attended the Tuesday evening event at Laurel Oaks Career Campus, sponsored by the SOESC Governing Board of the four-county area comprised of Clinton, Fayette, Highland and Adams counties. Keynote speaker was longtime East Clinton Middle School teacher Nancy Reeves, the 2019 Teacher of the Year for State Board District 10. She has also been honored as the American Legion 2018 Educator of the Year Post and District winner and two-time ECMS Outstanding Teacher of the Year. Reeves spoke on the importance of school administrators encouraging and recognizing teachers, in their day-to-day work in the classrooms as well as working to help them achieve recognition by their works and deeds, including by nominating them for awards such as Teacher of the Year not only locally but statewide. • Master Teacher Renewal: Stephenie Eriksson, Blanchester High School English teacher; and Andrea Harpen, BHS science teacher. Two Clinton Countians — Wilmington News Journal Sports Editor Mark Huber and Editor Tom Barr — were each presented Friend Of Education Awards by the four school district superintendents of the county: Dean Lynch of Blanchester, Mindy McCarty-Stewart of Wilmington, Matt Baker of Clinton-Massie and Eric Magee of East Clinton. Presenters and speakers for the evening included SOESC Superintendent Beth Justice, Great Oaks Career Campuses President/CEO Harry Snyder, SOESC Governing Board President Martha Gausman, and SOESC Governing Board Vice President Jim Luck. Colors were posted by Wilmington’s American Legion Post 49 Color Guard. Entertainment during dinner was provided by members of the Wilmington High School Choir and Instrumental Program, directed by David Beck and Matthew Spradlin, respectively. Vocalists were Melissa Stroebel, Julia Tolliver, Aubree Trusty and Emily Walls. Instrumentalists were Abby Bowman, Hannah Colley, Rebecca Durflinger, Haley Fouch, Nicole Gallion, Damian Garlo, Anna Garnai, Elizabeth Grimes, Aaliyah Huff, Makenna Kinsey, Olivia Massie, Avery Parrish, Emily Quallen, Regan Sparks, Destiny Tackett, Maria Totten, Sydney Totten, Jada Walker, Paiton Walker, Gabe Weston, Nathan Wood and Ella Zeigler.